Lead generation is not a child’s play. In fact, it’s really tough. According to the MarketingSherpa report, a lot of digital marketers still rely on traditional ways of lead generation—going through a list of people or organization and sending them cold emails. However, most often than not, these accustomed methods are not properly utilized. There is also the issue that most people nowadays are more cautious with their personal emails because of email spams and scams. While lead generation can be a pretty challenging job, there are actually ways that will surprisingly help you acquire a whopping number of quality leads. In the rest of this article, I will show you the 5 proven lead generation strategies that you can hack to grow your leads by 3X. Many people love attending webinars; it’s a great way to enhance knowledge and acquire more skills on a particular field. While most people find webinars resourceful, most marketers then find it as a good opportunity to generate leads. And if you’re wondering why you should host a webinar, here’s an infographic that shows you the reasons that many people choose this path. 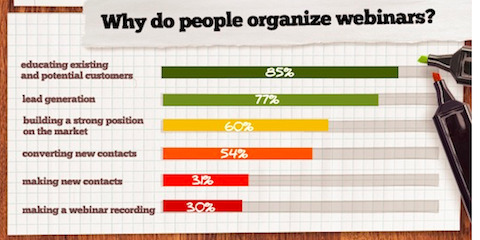 75% of marketers organize webinars in order to generate leads. In fact, a study from the University of Twente in Netherlands tested the effectiveness of using webinar as a marketing and sales tool. The findings of the study revealed that webinars evoke positive reactions from the respondents. This only shows that using this strategy in marketing campaigns can get you more leads and traffic. To establish brand reliability and authority – Hosting webinars gives you and your brand the impression of expertise in the field. Most businessmen want to know more about you and your company first before deciding to do business. What better way to do it than to host a webinar? 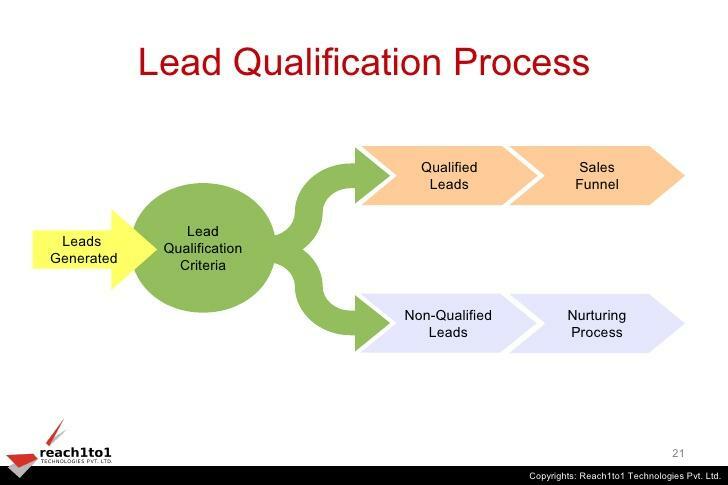 To acquire top quality leads – Webinars are technically the best way to generate strong potential leads. Why? Because people who sign up and attend your webinar are the people who have the most interest in getting more knowledge about the things you are going to discuss. Refining your content – Your audience’s comments, feedback, and questions can help you gather essential information. 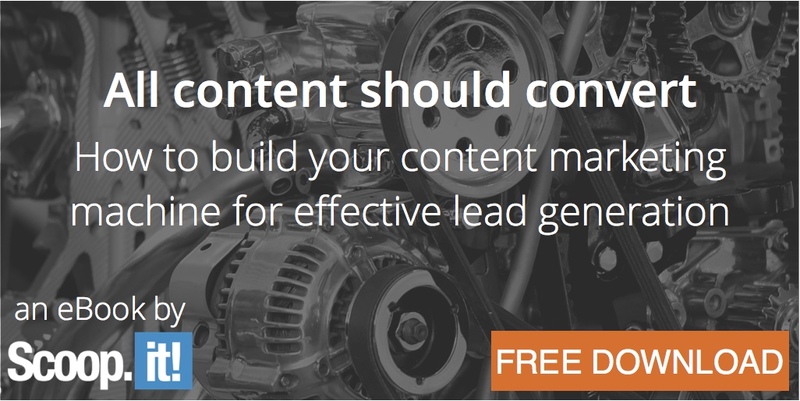 You can also breakdown and reuse the important information in your hosted webinar and publish it into an eBook, blog post, etc., which you can then use to fuel content marketing. No location barriers – The problem with workshops and seminars is its dependence on the location of the meeting place. With a webinar, attendees can just sit back in the comfort of their living space without having to worry about traveling. Business opportunities – Collaborating with another brand in hosting a webinar gives you the benefit of increasing brand awareness and generating more high-quality leads. Chatbots have triggered a lot of hype lately. Some people are still confused on how reliable these chatbots are, and whether or not they can be used for lead generation—even though their primary purpose seems to be directed towards customer experience. Chatbots can be used for retargeting, lead generation, customer service, among many others. Since we’re concerned about generating more leads for our businesses, chatbots which are basically messaging apps can help to find, engage, convince, and convert potential leads into customers. However, you need the right lead or sales bot to achieve that objective. Sure, there is software available but using Tagove lead bot you can acquire leads easily—even when you’re asleep. Interestingly, by qualifying these leads, Tagove company increased engaged and leads by 3X after implementing this lead bot. Unlike other chatbots that are limited to direct customer service communications, Tagove goes the extra mile and helps you to validate the email address to ensure it’s in the right format. When you need smart data and insights to make decisions, especially in the research phase of your projects, the aforementioned chatbots can offer advice; providing an avenue for a new form of content marketing. When you begin to use lead bots, it means you can market to potential customers where they are. Chatbots generate a high response rate. But don’t take my word for it. Bot Academy conducted a bot experiment at Mixergy and saw an open rate of over 80% and a 50% click rate. Having high-converting landing pages is extremely important if you want to generate a bigger profit in your business. Not convinced? 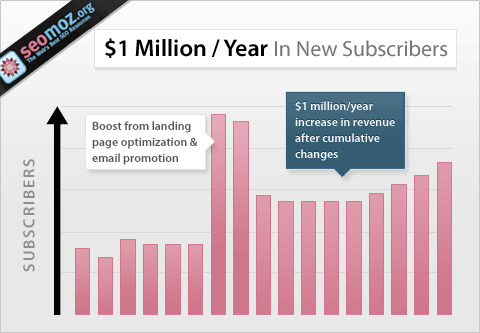 Well, just take a look at this proof from the Conversion Rate Experts. Increasing your revenue by $1,000,000 in a year can seem hardly possible for websites that aren’t as big as Moz, however, even if you don’t earn that big amount of money on your own, having a high-converting landing page can still help your business build a strong foundation of success. Many digital marketers tend to believe that driving traffic to their website is what will give them more conversions. That is actually a huge misconception. The effort you make in generating traffic to your website becomes pointless if your audience hardly finds anything on your website that will catch their interest. 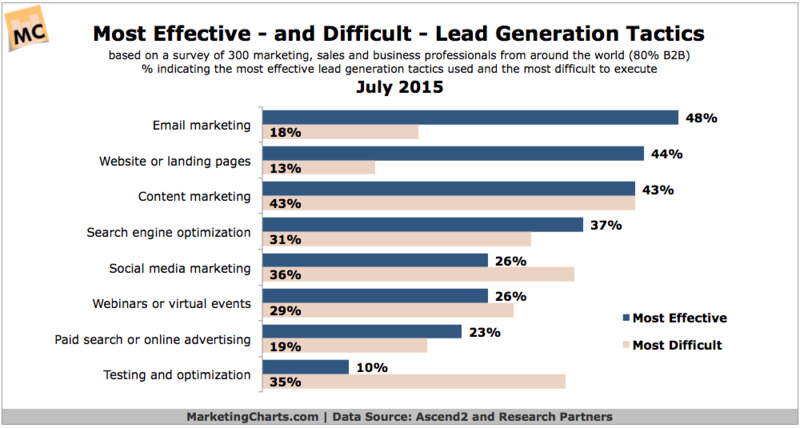 Based on a research conducted by Ascend2 and its partners in research, email marketing appeared to be the top lead generation tactics. However, email listing upsets most people. As much as you want to drive more sales for your business, you also don’t want to annoy your audience and have them leave your website. Present a slide asking for the user’s email when the page is scrolled down. Email list building is an ongoing process; there is no definite time with respect to when you are going to stop building this list. People will subscribe and may unsubscribe at some point. Remember that having a good list gives you the rare opportunity of generating potential leads at will and eventually driving sales. Whether you have a small business or not, having social media presence is compulsory if you want to get noticed online. Nowadays, social media is not only used for socializing and keeping in touch with people, it is now also a powerful tool for marketers in showcasing their brand. It helps marketers keep in touch with customers, business partners, and reach potential customers. There are a lot of social media platforms you can utilize for your brand. Moreover, it is important to do further research as to which platforms suit your business line the best. Study your competitors and their social media channels. See which platforms tend to get a lot more engagement with potential customers. Wouldn’t it be cool if you can apply these proven “hacks” to your online marketing and finally take your lead generation to the next level? In all, learn to optimize your existing website traffic. 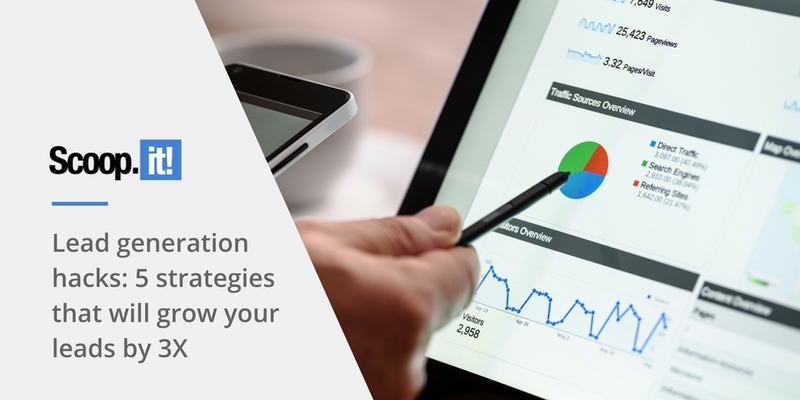 If your website is already generating traffic but you’re not converting them, then it’s time to re-evaluate your strategies. Target your LinkedIn followers, Twitter fans, and those on your email list. Whenever you run a campaign, begin with what you already have—and don’t be overly concerned with the leads outside—what about those in-house? Generating leads and closing sales can be easy if you know what you’re doing. Though it requires multiple steps and tedious tasks, it will be well worth your while by the time you see your sales and revenue growing exponentially. Of course, there are definitely more hacks that you can implement in order to get more qualified leads for your business—still, the ultimate key to winning in the lead generation game is to be dedicated and always willing to test new strategies. As always, I’d love to know what your best lead generation hack is. Leave your thoughts in the comment box. Sawaram Suthar is head of marketing at Acquire, a multichannel customer communication platform and also a founder of Jagat Media & TheNextScoop. A digital marketing consultant, he has experience in things including branding, promotions and page optimization, along with research and strategy. He has an MBA from the University of Pune. 3 Comments on "Lead generation hacks: 5 strategies that will grow your leads by 3X"
The article is good. Off late we are seeing that everybody is using these tactics to do the lead generation and gradually the cost of leads is increasing. One of the other ways to get leads is to publish tools on to your website which your prospects will love. This way the cost of generating leads goes down considerably and the time to go to market is less than 5 minutes. Very nice article Sawaram. I usually follow all your posts and I should admit that you share really well researched and good content. Keep up the good work. Great Article very easy to understand each point is well elaborated Lead Generation hacks are important to remember always..